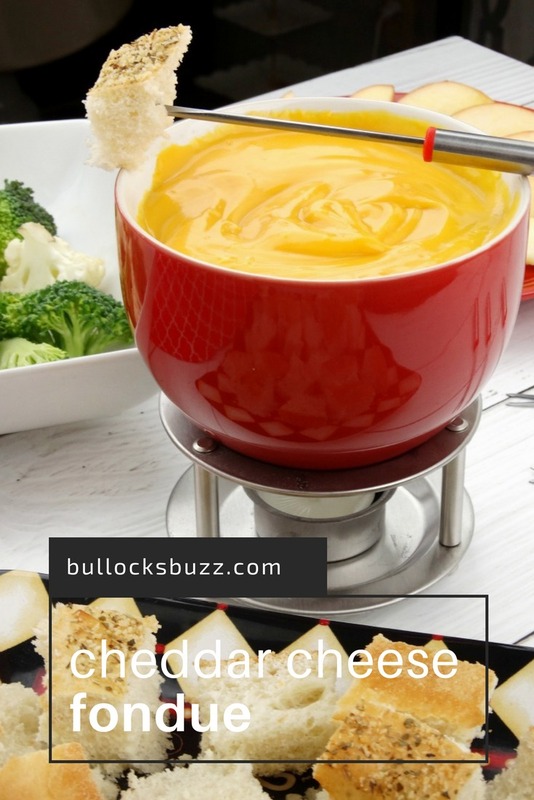 This smooth and creamy Cheddar Cheese Fondue is an easy cheese fondue recipe that’s perfect as an after school snack, for a romantic dinner for two, or for a fun fondue party with family and friends! I love cheese! All kinds of cheese. If I could, I’d eat it all the time. There’s just something so yummy about the taste. And it goes so well with so many foods – whether it’s for breakfast, lunch or dinner. One of my favorite flavored cheese is Cheddar. It’s so versatile and has such a deliciously sharp flavor. It made this Baked Cheesy Chicken Broccoli Casserole come alive! 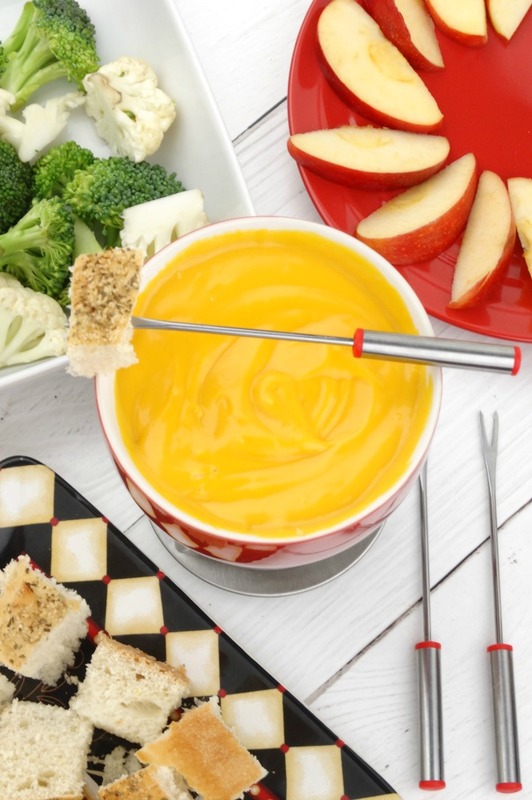 And it tastes even better in this Cheddar Cheese Fondue recipe! Made with Ricos Aged Cheddar Cheese sauce, this Cheddar Cheese Fondue is so good, you are going to love it! Why Ricos? Not only does their cheese sauce taste great, it’s trans fat-free and made with no hydrogenated oils. 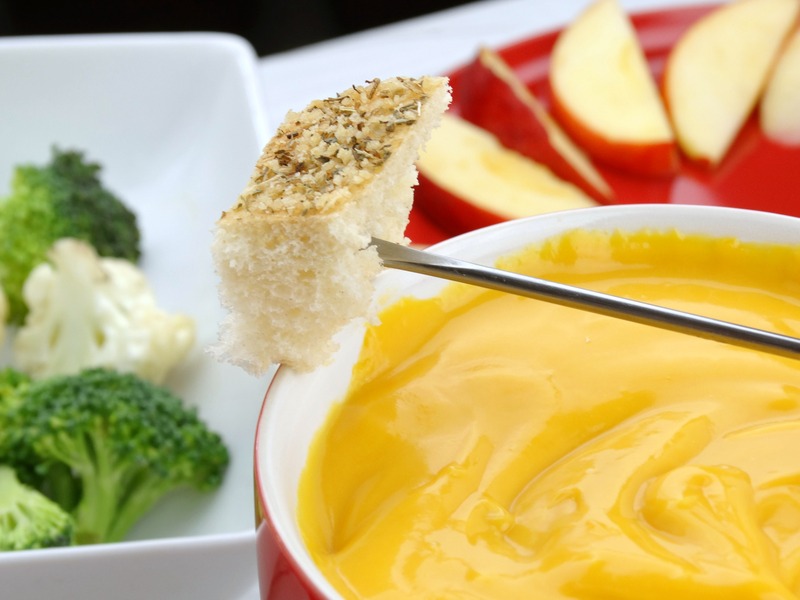 What kinds of things can you dip in this Cheddar Cheese Fondue? I LOVE Cheddar fondue because there is so much you can do with it! The number of dippers that you can use are absolutely endless. We love to dip French bread, Italian bread, soft pretzels, broccoli, cauliflower, apples, Tortilla Chips, shrimp, sausage and potatoes – the list goes on and on. After all, everything tastes better with cheese! 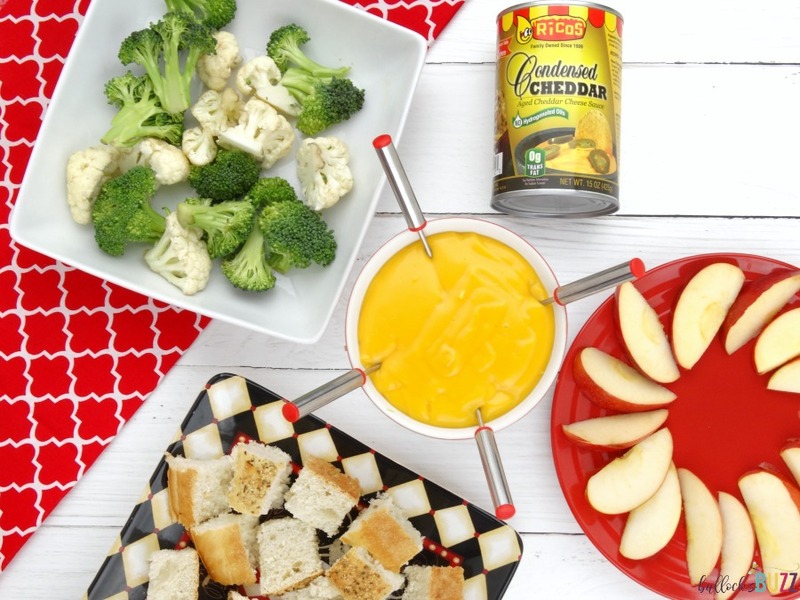 By the way moms and dads, cheese fondue is a fantastic way to get your kids to eat their vegetables! I’ve discovered that I can get my stepson to eat things he normally wouldn’t, as long as he can dip it in some yummy cheese dip. Another thing I love about this fondue recipe is that you can cook it with or without a fondue pot! I have a small fondue pot that I love, but it’s tiny and more for serving than cooking. I make this recipe in a saucepan and it works just fine. If you are using a fondue pot, just remember to keep the heat down fairly low so you don’t scorch the cheese.  Before I get to the recipe, there’s a few tips I want to share. First of all, although I listed shredded Cheddar as an ingredient, you may find that it is plenty cheesy enough with just the Ricos. Try giving it a taste before you add the shredded cheddar. Secondly, if you are using a fondue pot, try rubbing a clove of garlic around the inside of the pot before adding the cheese. Yummy! Also, when dipping your food, swirl it in a figure eight motion – this will help keep the cheese smooth. One more little note… like most fondue recipes, this one uses alcohol…BUT you can easily substitute chicken broth instead. 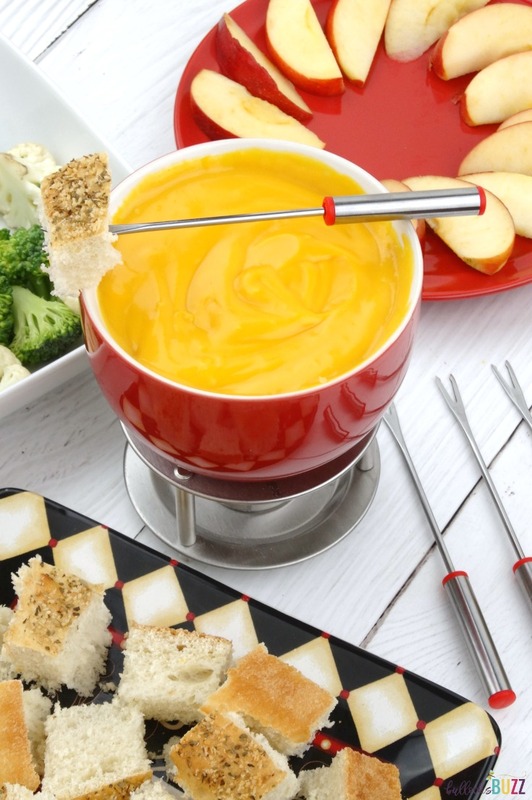 So, are you ready to see how to make this easy-peasy Cheddar Cheese Fondue? 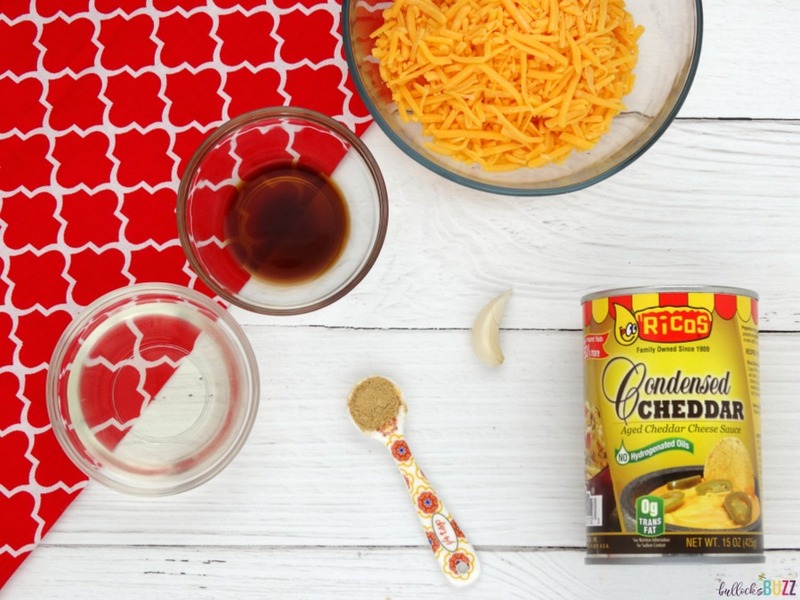 Combine the Ricos Cheddar Cheese, wine (or chicken broth), minced garlic, Worcestershire sauce, shredded Cheddar (if using), and dry mustard together in a small saucepan. Cook over medium-low heat, stirring frequently, until the mixture is smooth, about 7-10 minutes. If you added shredded Cheddar, make sure it is completely melted before serving. Serve with all of your favorite dippers and enjoy! A deliciously easy, smooth and creamy Cheddar Cheese Fondue recipe that goes perfectly with fruits, veggies, meat and bread! If you are using a fondue pot, try rubbing a clove of garlic around the inside of the pot before adding the cheese. Yummy! When dipping your food, swirl it in a figure eight motion - this will help keep the cheese smooth.